We are nearly one week in to the passage of the censorship machines. One of the issues with this debate is the fact that a lot of the consequences haven’t been fully analyzed. In retrospect, it’s understandable. With such an unprecedented wave of opposition towards the directive (by unprecedented, we mean in the world of digital rights), things actually started looking good when politicians began retracting their support for the directive. Most of the focus was centred around putting a stop to the laws. So much focus was put on stopping it, it wound up becoming one of those laws that shouldn’t have passed, but somehow wound up passing anyway. Despite setbacks, the most controversial clauses of the Copyright Directive — Article 11 or the ‘link tax’ and Article 13 — have remained pretty much intact. Article 11 lets publishers charge platforms like Google News when they display snippets of news stories, while Article 13 (renamed Article 17 in the most recent draft of the legislation) gives sites like YouTube new duties to stop users from uploading copyrighted content. In both cases, critics say these well-intentioned laws will lead to trouble. Article 13, they say, will lead to the widespread introduction of “upload filter,” that will scan all user content uploaded to sites to remove copyrighted material. The law does not explicitly call for such filters, but critics say it will be an inevitability as sites seek to avoid penalties. Assuming this law is implemented, Google may choose to shut down Google News in Europe. (It pulled out of Spain in 2014 after that country implemented a similar rule around displaying snippets of text.) Google has said it could follow suit across Europe, and other companies could follow. If Google has to pay to effectively quote news stories, what other websites might face similar restrictions? It’s easy to imagine a chilling effect across the entire internet. The “upload filter” Vincent mentions would have a similar — and dire — chilling effect on sites like YouTube. The company famously played fast and loose with copyright during its early days, and Europe apparently has a long memory. There have been a number of arguments being bandied about on the web. Some of those arguments involve the idea that Alphabet (parent company of YouTube and Google) can afford to pay for the multi-million filtering technology. As a result of these laws, these big sites would ultimately become entrenched as a monopoly as competing services die off one by one in Europe. 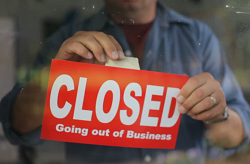 After all, what small business can afford to stick around under these circumstances? Corporate lobbyists often argue that these laws are only for the big players who make 10 million euro’s or more in annual turnover, so small businesses would be exempt. Unfortunately, this is an extremely misleading statement. Provisions in the copyright directive do explicitly state that this is a threshold, but it is not the only one. Another threshold is whether or not that business has been around for 3 years. This regardless of how many pageviews per month or how much the company makes. If you have a slow growing company, three years is ultimately your drop dead date. This fact is, of course, conveniently glossed over by those supporting the laws and are actively trying to tell people that the Internet will be just fine and that people should just continue on with their lives. So, with small businesses being put on notice that their time is up, it’s easy to see this as a slow moving issue. It’s also easy to look at this whole issue and say that this doesn’t impact websites that are off shore anyway because thy are not under those crippling laws. Unfortunately, this may wind up being a false sense of security. This is because the laws have to be ratified in Europe’s 28 countries. If offshore websites are basically except from the laws, how will countries implement the copyright directive? As we’ve noted two days ago, France is announcing that it will implement the censorship machines quickly. Part of the announcement involves the administration of Internet blacklists. This, of course, caught our attention. Throughout the debate up until the passage, there was, to our knowledge, never any discussion about outright blacklisting non-compliant websites. The question is, if France is going to implement censorship blacklists for websites, what about other countries? That remains to be seen. Still, this plays into the idea that we are seeing the beginnings of a great Internet tearing. Steps are already being made to hive off the Internet and build a Eurozone Internet. This is much like what happened in China with it’s world-famous “Great Firewall of China”. Other countries have also hived off their portions of the Internet as well. With Europe leading the way, there won’t be very many places left on the web that is truly free. Obviously, we’ll have to monitor how these laws are being implemented in the respective European countries. With France’s announcement, the surprisingly quick implementation is off to a really bad start.